In this issue: Who contracts with whom? A brief analysis of Chinese exports to the United Kingdom; Getting the carrier right: risky bills? ; English court looks at an “agent/principal” relationship; Good faith – a new universal implied duty on contracting parties? ; News; Conferences and Events. In this article, we consider how Chinese manufactured goods reach the shelves of UK retailers. The UK was once the “workshop of the world”, with a huge manufacturing sector exporting manufactured products to the four corners of the globe. During the late 20th century, however, the UK gradually became a net importer of manufactured products. During 2011, for example, the UK’s imported physical goods were worth about US$637 billion1 compared to only US$473 billion2 in physical exports, a difference of 25% in financial terms. The major retailers (such as Tesco, Next, Marks & Spencer and Asda) are responsible for importing huge quantities of clothes, toys and general merchandise manufactured in the Far East. At first, most retailers and distributors bought foreign sourced goods on a “delivered” basis on CIF or CFR terms, which (in their un-amended INCOTERMS 2010 form) place on the supplier the responsibility for delivering the goods at the UK discharge port. As time progressed, large retailers and distributors began switching to buying the majority of their goods on a “collect” basis, either on FOB terms (risk passes to the buyer when the goods are placed on board the vessel) or FCA terms (risk passes to the buyer at the terminal). This was because it was recognised that allowing their small Far East suppliers or their UK agents to buy freight was generally inefficient: each supplier would have relatively little buying power in negotiations with shipping and forwarding companies because it had small volumes and the supplier would also add a margin to the transport costs to reflect its time and efforts. Many UK retailers remain wedded to FOB terms in spite of the International Chamber of Commerce’s (ICC) submission that FOB terms are inappropriate for container movements. The ICC recommends that importers buy containerised goods on Free Carrier (FCA) terms.3 This does not, however, seem to have filtered down into the industry. Many of the large retailers are unhappy simply to apply un-amended INCOTERMS to their purchasing contracts and will instead insist on suppliers contracting on the retailer’s own standard purchasing contracts, which tend to include tough supplier warranties and lengthy terms of credit. The migration by retailers and distributors to FOB or FCA terms has meant that they now need to contract directly with a shipping or forwarding company to carry the goods from the origin container terminal and deliver them to the UK. In the modern world, importers requiring full container load shipments4 can buy multimodal transport services directly from the container shipping lines (such as Maersk, MSC and CMA-CGM) or via freight forwarders (such as DHL, CEVA, SDV, Uniserve or Damco). Most of the UK’s largest importers now run annual freight tenders directly with their MTOs. Multimodal transport bills allow MTOs to contract for the movement of goods to destinations beyond that envisaged by a traditional port-to-port bill of lading. By using a multimodal bill, the MTO can contract to carry the goods from a place of receipt prior to the port of loading and to a destination post the port of discharge. It is therefore perhaps surprising that most UK retailers still tend to ask their MTO suppliers to provide them with “port-to-port” rates in their annual tenders for Far East to Europe freight. They rarely ask for “port-to-door” or “door-to-door” rates. It follows from this that most bills of lading issued by MTOs in relation to retail importers are “port-to-port”. This does not mean that the shipping lines do not then go on to contract for non-ocean legs, it just means that when they provide such services they will often do so outside the terms of the MTO’s bill. Increasingly, many large retailers are entering into tailor made carrier service agreements with MTOs which seek to deal with important commercial and operational issues such as performance levels, rate reviews and space allocation guarantees. Sometimes they also include enhanced liabilities going beyond the liability regime in the MTO’s bill. These contracts are typically expressed to override the inconsistent terms within the MTO’s bill of lading which will be issued in relation to the retailer’s shipments. Many terminal operators which contract with shipping lines acting as MTOs will have their own standard terms and conditions which they will seek to rely on when claims arise. However, major shipping companies tend to negotiate bespoke agreements with those terminal operators on a shipping line’s normal trading route with which it operates large volumes of business. Depending on negotiating strength, these agreements will be subject to the law and jurisdiction of the country in which the terminal is based or the preferred law and jurisdiction of the shipping line. In the UK, most container haulage movements from terminals are carried out by sub-contractors to shipping lines, which is called “line haulage”. There is, however, some “merchant haulage”, where the importer of the goods (or his freight forwarder) will arrange for its own contracted haulier to collect the goods from the UK discharge terminal. Buying goods from the Far East is not a simple business. Whilst there are some large manufacturers in China, Malaysia and Thailand, the vast majority of the manufacturing companies in the clothing, toy and general merchandise trades are relatively small. The retailers are also very mobile with their purchasing and will frequently switch suppliers in light of competitive tenders or the appointment of new buying agents. Big retailers can have thousands of Far East suppliers providing them with products, which means that their supply chains are fast changing and complicated. Forwarders are engaged to manage these complex multi-origin supply chains. Predicting the medium term future is difficult but it will almost certainly involve further growth in containerised multimodal transport, with importers demanding ever more onerous carrier service agreements from the MTOs. The forwarders are likely to get bigger and there will almost certainly be consolidation amongst container shipping companies. Whether the forwarders end up “controlling” significantly more ocean freight than they currently do remains open for debate. Unless there is vertical integration between forwarders, shipping lines, terminals and/or hauliers, it is hard to see how the general structure of the contractual arrangements discussed above will radically change. If, however, the Rotterdam Rules come into effect, each and every contract will probably need to be revisited and re-written. 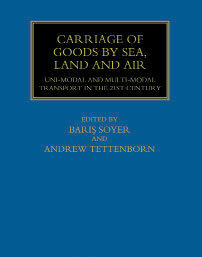 This article is an abridged version of the paper written by Craig Neame for “Carriage of Goods by Sea, Land and Air” edited by Professor Baris Soyer and Andrew Tettenborn. For more information, please contact Craig Neame, Partner, on +44 (0)20 7264 8338 or craig.neame@hfw.com, or Luke Garrett, Associate, on +971 (0)4 423 0510 or luke.garrett@hfw.com, or your usual contact at HFW. “Less than container loads” (also known as LCL or “consolidations”) are outside the scope of this paper. The forwarders control this business. Getting the carrier right: risky bills? The recent case of The Lucky Lady1 is an important reminder to time-charterers/disponent owners to ensure that the correct details are entered on bills of lading and that if the parties want an arbitration agreement to be incorporated this must be expressly stated on the bill of lading. A dispute arose out of a shipment of palm oil and palm olein from Malaysia to Jordan between December 2011 and January 2012. The cargo was shipped on board the ‘LUCKY LADY’ (the Vessel) pursuant to five bills of lading. The Claimant, Navig8 Pte Ltd (Navig8), was the time charterer and disponent owner of the Vessel, having chartered her from the registered owners, Ladies Shipping Limited. Navig8 sub-time-chartered the Vessel to Pacific Inter Link SBD BHD (PIL) on the Shelltime 4 form (the Charterparty), the terms of which were incorporated into the bills of lading. The Defendant, Al-Riyadh Co for Vegetable Oil Industry (Al-Riyadh), was the receiver of the cargo, having purchased it from PIL. The charterparty was governed by English law and provided for disputes to be referred to arbitration in London. At discharge in Jordan, Al-Riyadh rejected the cargo on the grounds that the cargo was of poor condition. Al-Riyadh issued a claim in Jordan against both PIL (as the seller) in the event damage had been caused pre-shipment and Navig8 (as carrier under the bills of lading) in the event damage had been caused during shipment. Who was the lawful ‘carrier’ under the bills of lading? ‘This shipment is carried under and pursuant to the terms of the Charter … between [Navig8] … as Owners and [PIL] as Charterers… The contract of carriage evidenced by this Bill of Lading is between the shipper, consignee and/or owner of the cargo and the owner or demise charterer of the Vessel named herein to carry the cargo ...’ (emphasis added). Al-Riyadh relied on the fact that the bills of lading did not refer to the registered owners, but named Navig8 as ‘carrier’ and argued that as a consequence, the Jordanian Court should interpret the bills of lading as evidence of a contract between Al-Riyadh as receiver and Navig8 as carrier. It was common ground between Navig8 and Al-Riyadh that, as a matter of Jordanian law, Navig8 were likely to be found to be the ‘carrier’ under the bills of lading. It was also common ground between the parties that, because Jordan had enacted the Hamburg Rules (which provide that a plaintiff may commence proceedings in a court of the place of loading or discharge), the Jordanian Court had jurisdiction to hear Al-Riyadh’s claim for damages. Navig8 sought, among other things, an anti-suit injunction from the English High Court on the basis that the bills of lading incorporated the London arbitration clause contained in the charterparty. This was rejected, as it is well established that general words of incorporation do not cover arbitration agreements. The English Court confirmed that as a matter of English law, it was English law that governed the bills of lading. As a consequence, Al-Riyadh had no claim against Navig8 under the bills of lading because Navig8 was not a party to them – the registered owners being the lawful ‘carrier’ – and Navig8 successfully obtained a declaration from the English Court that Navig8 was not a party to the bills of lading. Ensuring that the correct party is identified on the bill of lading as the ‘carrier’. Failure to do so may result in the receiver being entitled to sue the time-charterer/disponent owner in the country of discharge under local laws. For more information, please contact William Gidman, Associate, on +44 (0)20 7264 8579 or william.gidman@hfw.com, or Alice Marques, Associate, on +44 (0)20 7264 8471 or alice.marques@hfw.com, or your usual contact at HFW. HFW represented Al-Riyadh. Richard Merrylees and Alice Marques were the case-handlers. Some of the most common commercial disputes arising out of carriage of goods involve issues such as the contracting capacity of parties – the age-old “agent or principal” question – and liability for demurrage costs incurred when goods have been seized or detained en-route or at the port of discharge. The English Commercial Court was recently faced with a case involving both of these issues1. The claimant shipping company, Cosco, was contracted to carry loaded containers from the UK to Vietnam. The contents of the containers were said to be building blocks, but in fact were used tyres, import of which into Vietnam is prohibited. Some of the containers made it to Vietnam but were not collected by the consignee, others were intercepted by Cosco at Hong Kong, where the consignee also failed to take delivery. When Cosco intercepted the containers at Hong Kong, they instructed local surveyors to inspect the contents and validate that the contents were in fact used tyres, which they were. Cosco then sought to recover its unpaid ocean and road freight, its costs of surveying the cargo at Hong Kong, and its container demurrage charges from the shipper of the containers in accordance with the terms and conditions contained within its bill of lading. A question arose, however, as to which defendant was truly the shipper of the goods under the bill of lading. Robert Batchford (trading as County Contractors) (Batchford) was named as the shipper on the bill of lading, but the carriage of goods was arranged by Gunter Scheller (trading as Kent International Freight Services UK Limited (Scheller)). Scheller argued that he was acting solely in his capacity as a freight forwarder and was merely Batchford’s agent. On the other hand, Batchford argued that Scheller did not have authority to act on his behalf, and that Scheller, alleged by Batchford to be acting on his own behalf, should be considered the shipper under the bill of lading. The court was asked to consider which was the party to the contract of carriage. His Honour Judge Richard Seymour QC undertook what can only be described as a forensic crusade to identify Cosco’s counterparty, by closely examining every shred of evidence before him. Ultimately, the Court held that Scheller was Batchford’s freight forwarding agent and had authority to arrange the contracts of carriage with Cosco on behalf of Batchford. But on what basis was the decision reached? The Court considered both the documentary evidence put before it, and also heard the oral evidence of Batchford. Amongst many things looked at by the Court in reaching its decision, it held that the role of Batchford, as owner of the cargo, was consistent with that of a shipper. The Court also looked at other business arrangements involving Batchford and Scheller where contracts of carriage were arranged by Scheller, clearly acting in the capacity of agent – the Court was assisted in reaching this decision by the fact that, in one of these other arrangements, Batchford had provided a “shipper’s indemnity” to the line involved. The Court also gave weight to the fact that Batchford’s actions after the mis-declaration of the cargo was discovered, which included not raising any objection to being named as shipper when he had sight of the bill of lading, and attempting to find an alternative destination and purchaser for the cargo were again consistent with being the shipper. The Court was, however, unable to give judgment against Batchford for Cosco’s demurrage charges, because it had sought to claim these as damages and the Court was unable to find that Cosco had incurred the demurrage as an expense to another party, which would have entitled it to an indemnity. Rather, the demurrage charges were recoverable under the contact of carriage, and a claim for this was not included in Cosco’s Particulars of Claim. This was rather fortuitous for Batchford. This case required the Court to consider some convoluted facts and unusual sale arrangements. Whilst the exact circumstances are unlikely to arise again, this case is a warning to freight forwarders who, in seeking to assist their customers by either attempting to solve a detention issue or find another purchaser, may find themselves on the wrong side of an argument that the freight forwarder is liable for freight and expenses incurred by the shipping line. For more information, please contact Ewelina Andrzejewska, Associate, on +44 (0)20 7264 8576 or ewelina.andrzejewska@hfw.com, or Matthew Wilmshurst, Associate, on +44 (0)20 7264 8115 or matthew.wilmshurst@hfw.com, or your usual contact at HFW. In the recent case of SKNL (UK) Ltd v Toll Global Forwarding1 the English Commercial Court was asked to determine whether a contract incorporated the BIFA Standard Trading Conditions (the BIFA Terms) and if so, whether the anti set-off clause within the BIFA Terms would apply to overpayments made under previous contracts. In the course of doing so, the Commercial Court was asked to consider whether the BIFA no set-off clause was reasonable. In January 2010, pre-contractual discussions took place between SKNL and Toll during which a document entitled ‘Service Agreements’ was used. The document contained no specific terms, merely headings of provisions which were to be agreed. During a subsequent meeting these headings were used and it was decided that Toll would draw up a document to evidence what had been agreed during the meeting. The document which was drawn up by Toll in June 2010 included an additional clause on liability and expressly incorporated the BIFA Terms. The BIFA Terms were also used on Toll’s invoices raised during the course of the two parties’ dealings. Disputes later arose between the parties concerning payment of interest under the Toll invoices and debit notes had been issued by SKNL on the basis that Toll had not performed certain tasks adequately. Toll exercised a lien over SKNL’s cargo for the unpaid charges. SKNL paid these charges and subsequently issued proceedings against Toll for the alleged failures in performance. Toll counterclaimed for sums that they claimed were due for VAT and duty paid on stock returned by SKNL. Toll subsequently applied for summary judgment in advance of SKNL’s claim being heard. Toll advanced their counterclaim on the basis that the contract between the parties incorporated the BIFA Terms and that the set-off clause within the BIFA Terms did not allow SKNL to withhold monies due to Toll. The wording of the set-off clause was as follows: “That the customer shall pay to the company in cash, or as otherwise agreed, all sums when due immediately and without reduction or deferment on account of any claim, counter-claim or set-off”. SKNL disputed that the contract incorporated the BIFA Terms or, in the alternative, argued that if the BIFA terms were incorporated, the set-off clause did not preclude SKNL from setting-off overpayments in respect of prior transactions. Mr Justice Cooke rejected SKNL’s defence that the set-off clause would not apply and granted Toll’s application for summary judgment. Cooke J held that the test for the incorporation of standard terms was based on the actions of each party and what a reasonable person in their position would conclude as to the terms governing their dealings. Based on this reasoning the Court determined that the BIFA terms were incorporated during the extensive dealings between the parties in June 2010 along with the invoices issued by Toll. Cooke J added that it would be obvious to those dealing with a freight forwarder that there would be a set of standard terms and conditions which would apply beyond those agreed between the parties. It was the Court’s view that, although SKNL might be successful in their claim for failures in performance by Toll, they were not entitled to set-off monies owed to Toll by virtue of the anti set off clause – which they considered reasonable in the circumstances. This case is a useful example of the approach that the English courts take to incorporation of contract terms, and contains some good news for BIFA members, in that the Court has once again shown a willingness to enforce the no set-off clause in the BIFA terms. For more information, please contact Luke Garrett, Associate, on +971 (0)4 423 0510 or luke.garrett@hfw.com, or Matthew Wilmshurst, Associate, on +44 (0)20 7264 8115 or matthew.wilmshurst@hfw.com, or your usual contact at HFW. SKNL (UK) Ltd v Toll Global Forwarding  EWHC 4252 (Comm). Good faith – a new universal implied duty on contracting parties? English law does not currently recognise an implied duty on contracting parties to perform their obligations in good faith. However, the Civil Codes of France and Germany and common law systems of the US and Australia all recognise some form of duty at least to some extent. Several recent cases have reignited the debate as to whether English law implies a similar duty, and it will be interesting to see whether in the future a duty of good faith will develop further as case law builds up. Furthermore, arguably there has been growing pressure for English law to develop due to the increasing influence of European law through European Directives. However, the duty of good faith remains a fledgling concept poorly defined in English law and parties should be wary of including ‘good faith’ provisions in contracts, as they will likely be narrowly interpreted and too uncertain to be binding. ‘To act in good faith’ essentially means being honest, although this is arguably subjective and dependant on specific terms of the contract and its commercial context. The recent case of Compass Group v Mid Essex Hospital Trust  EWHC 78, considered a ‘good faith’ provision in an outsourcing contract, stating both parties would co-operate with each other in good faith and would take all reasonable action for the efficient transmission of information and instructions and to enable the Trust to derive the full benefit of the contract. Under the contract with Compass, the Trust had power to make deductions from monthly payments and award service failure points if Compass did not reach the service levels required. A dispute arose over which party had the right to terminate the contract and during the process the issue of whether the parties had an obligation to co-operate in good faith emerged. The trial judge found there was an implied term that, in exercising this power, the Trust would not act in an arbitrary, capricious or irrational manner. The Court concluded the Trust had acted in breach of this implied term and therefore had breached its duty to co-operate in good faith with Compass. Subsequently, the Court of Appeal overturned the decision of the first instance court, and did not favour the addition of an overarching duty to co-operate in good faith, as the two specific circumstances to which the provisions of good faith applied had been precisely expressed within the relevant clause and were deemed separate as a matter of interpretation from a general duty of good faith. Beatson LJ stated the obligation to co-operate in good faith must be assessed specifically with regard to the provisions of the relevant clause, other contractual provisions and the overall context. It should be noted that the facts and outcome of this case are unusual and unique and the decision cannot be easily applied to other cases. In each case, the parties’ contractual background is critical in ultimately establishing what good faith means within the contract. Should parties wish to expressly include a ‘good faith’ provision in a contract they should be aware that, without clear drafting of the contract, the obligation of good faith remains unclear. It may be difficult to ascertain the required standard of conduct, and exactly what actions must be taken in order to meet the obligation’s requirements. If contracting parties wish such an obligation to apply they should specify the areas where they wish it to apply and, if they wish it to be overarching, this should be clearly expressed. Importantly, the existence of an obligation to act in good faith may not necessarily require both parties to actually act in good faith and therefore when drafting the contract consideration should be given to including a non-exclusive list of good faith behaviour. Furthermore, including a good faith provision might imply a lack of trust between the parties, thus adversely affecting commercial relations. Presently English courts are reluctant to impose an overriding obligation to act in good faith on contractual parties. However, Yam Seng PTE Ltd v International Trade Corporation Ltd  EWHC 111 marks a departure from this position, concluding English law already recognises a duty to perform contracts in good faith, not as a general principle but by implying terms into a contract based on parties’ objectively assessed intentions. Being a first instance decision, it remains to be seen whether the case will be confined to its specific facts or if it will be upheld by senior courts, and if so what impact it will have on the position of good faith as a concept in English law. We are of course keeping the position under review. In the meantime, if parties wish to include such an obligation into a contract, it is crucial that they do so expressly and inclear terms. For more information, please contact Matthew Gore, Senior Associate on +44 (0)20 7264 8259, or matthew.gore@hfw.com, or your usual contact at HFW. Written by a combination of top academics, industry experts and leading practitioners, this book offers a detailed insight into both uni-modal and multi-modal carriage of goods. It provides a comprehensive and thoroughly practical guide to the issues that matter today on what is a very complex area of law. HFW Partner Craig Neame contributed Chapter 6 – ‘Who Contracts with Whom? An Analysis of Chinese Exports to the United Kingdom’. Claim your exclusive 10% discount off this book, and other Informa Law from Routledge titles by using code ED228.